Skagit City was located on the South fork side of the Skagit River, less than a mile southeast of where the river forks north and south. Tom Robinson drove me to the very spot a couple of years ago and the bank is never covered with ferns and brambles where these buildings stood circa 1890-1900. The town began near where Barker's Trading Post opened in 1869. Within ten years, most of these buildings cropped up as Skagit City became the major crossroads for trading in the area that became Skagit County in 1883. During the 1870s, hotels, stores, saloons, a school, church, the Good Templars and Masonic lodges and other businesses were built to accommodate those who were claiming land above the river's log jams located where Mount Vernon is today. When those jams were cleared in the late 1870s , the town declined as other villages formed along the upper stretches of the river and sternwheelers ascended the river as high as Sterling and Hamilton, depending on the depth of the river. By 1906, only one building remained — the general store of Daniel E. Gage, the building at the far left. John G. Kamb Jr., a descendant of two pioneer families on Fir Island, showed us a faded copy of this photograph at the Skagit City School that does not have a date but the old handwriting on it indicates that it was from the 1920s or 1930s. It noted that the Gage store was the only one still standing at the time of the notation. Besides the store, the note indicated that the church at the far right was Baptist in affiliation and that the large white house in the center was the home and office of Dr. Thompson. One of the most prevalent questions we get from readers is: "Where is Skagit City?" That's a logical question, since that village is the one mentioned most often in early Skagit County-mainland history, pre-1884, yet the location is rarely pinned down. Readers want to know where they can see the remnants of it. First of all, the townsite is long gone, so there is no is. It had faded as a market center a century ago and most vestiges disappeared by World War II. After Mount Vernon was founded in 1877, about three miles upstream, and a path was carved through the two logjams by 1878-79 (see below), Skagit City's importance as a terminus for sternwheeler travel ended and the town became more of a social center than a market center. Those social bonds were broad and deep and were still in evidence a century after the town debuted. In 2010, NW Washington History Detectives meet-up is staged to revive interest in this very historic area and to help save the school from the wrecking ball. As with all our meetings, we ask guests to bring a potluck dish and there will was a $3 donation for administrative and organizing costs. We will coordinate this meet-up with the board of the school building and local organizations, and the help of John G. Kamb Jr. and Solveig Lee, who know the area very well. We ask guests to bring photos and scrapbooks and documents of the forks of the river, Fir Island, Skagit City and the surrounding area. Children are very welcome and we hope to have activities especially for them. See the NW Washington History Detectives link for details of the meet-up and a link that explains you optionally choose to join the group for free. A few years ago, author Tom Robinson and I traveled to the Forks area on the Skagit and we walked down to where we think that the village first bloomed in about 1872, a few hundred yards south of the break of the north and south forks. All we found was a collection of ferns, alder and nettles near the levy. John G. Kamb and I returned there in May 2007 and agreed on the same site. When you look at the aerial photo below, you will see a sand bar jutting out into the South Fork that looks suspiciously like the beach in front of the buildings in the historic Skagit City photograph above. Up until now, I have answered readers by referring them to a number of links in the Journal and elsewhere. In this issue, I have gathered together bits and pieces from those links and combined them with our research. Readers can also follow links to the individual stories to see more about the land itself and the pioneers who broke their backs as they settled there, a decade before Skagit County broke off from its mother, Whatcom County. This story will evolve, as all our features do, and it is now up to you to help us expand the story. Do you have photos or articles or diaries or letters or any documents from your family collection that you can copy for us? We never ask for your originals. Copies or scans will suffice. As with all our features, we annotate these stories with information in [ ] brackets. Barker and Campbell trading posts For those not familiar with Skagit City, it was a small village near the fork of the Skagit River, about three miles south of future Mount Vernon on the western shore of the South Fork. The South Fork was the main channel of the river for transportation and the North fork flowed west-southwest into a series of sloughs on the delta. At that early day Skagit City seems to have been the center of operations. At the Union hall in that place all manner of public assemblages, religious meetings, political conventions, entertainments, Good Templars' [prohibitionist] meetings, balls and socials, festivals and fairs were accustomed to gather. The Skagit City of that time was about half a mile above its present location. It seems to have been the general rendezvous for canoes, scows, booms of logs, and steamboats in so far as they appeared at all. The removal of the big jam from the vicinity of Mount Vernon a few years later [1877-79] destroyed the prestige of Skagit City. . . .
A man named Campbell, in 1868, established a small store at the forks of the river, where he kept and disposed of the standard goods for cash, a rather large amount of the latter being necessary to effect a trade for such patrons as had run out of the their regular store. This pioneer storekeeper of the Skagit had the untoward habit of spirituous imbibition to an unhealthy degree. On one occasion when he had reached a satiated condition, in his strenuous efforts to handle a barrel of sugar, which constituted his whole stock in trade, he managed to dump it in the river and to follow it immediately himself. A Siwash, who was not quite so drunk, extricated him from the watery depths. After some tedious work the barrel of sugar was also landed. It had absorbed so much water as to be turned to molasses, in which condition he disposed of it at advantageous prices to the hungry Indians. Campbell soon disposed of his mercantile interests to J.J. Conner, and he in turn sold out to [Daniel] E. Gage, who is still engaged in merchandising at Skagit City. . . .
For a new region the Skagit valley seems to have been somewhat singularly free from affrays and crimes. The only recorded murder of very early date occurred at Skagit City in the winter of 1869-70. A certain trader named John Barker had come to the valley during the previous year and had erected a shake shanty on the island near the junction of the forks. Among other merchandise which Barker dealt was the ever-present and ever-destructive whiskey, with which he supplied whites and Indians alike. Immediately across the north fork a band of Indians had established themselves and made some small clearings upon which were erected rude huts. One morning Barker was found lying in his shanty, his throat cut and his store ransacked. Shortly afterward some goods supposed to have been a part of the stock were found in the possession of Quinby [some sources spell the name as Quimby] Clark, who lived near, but before any investigation had been undertaken, Clark left the region. It is said that some of the south forkers formed a a mob in the meantime and hanged two Indians, supposing them to be the guilty parties. It appeared by subsequent investigation that Clark had shortly before wanted to get a squaw for whom thirty dollars was demanded. and that right after the murder he raised the necessary money. Also a subsequent investigation of the store showed plainly that the robbery and murder had been committed by a white man, for things which Indians would have taken were left and those which a white man would have taken were gone. Barker had been a Mason and the members of this fraternity spent three years in seeking the supposed murderer, but without avail. Here we share a suspicion that author Tom Robinson and I both have expressed about the treatment of both Indians and John Campbell by the authors of the 1906 Illustrated History. Siwash, a Chinook Jargon word, was derived from the French word, sauvage, and eventually became a term applied to all Indians, to their consternation, and it soon became a derogatory term. Some still employ the term that way. Campbell is also generally treated with contempt. As Robinson noted, the derogatory implications about Campbell may have been a smear job by his neighbors who were staunch Republicans and opposed to Campbell, one of the minority Democrats in the early settlers. We must remember that he appeared just years after the Civil War surrender at Appomattox. Robinson also wonders what the connection might have been between Campbell the storekeeper and the Swinomish Indian Johnny Campbell. We also wish that the authors had been more careful to distinguish between the Campbell and Barker trading posts, if indeed they were distinctly different, and we wish they had been more careful about their locations. Robinson discusses that further below. The most slanderous accusations about Campbell, however, appeared in a story in the book, Skagit Settlers that Joseph F. Dwelley based on a memoir by LaConner hotel owner John P. McGlinn. Also the federal Indian agent, McGlinn described a canoe trip that fall of 1874 that terminated at a spot about where William Hamilton's steamboat landing across the Skagit from Coal Mountain was located. McGlinn's canoe party included LaConner founders John S. Conner and his wife, Louisa Ann; Edward Seigfried [probably spelled Siegfried], Mrs. Conner's brother from Pennsylvania; James O'Loughlin, who owned a tin shop there, and his wife; and James Gaches, who started a general store there the year before with his brother and who would become one of the county's most famous early pioneers. The last member of the canoe party to Hamilton was John Campbell, a partner in a local trading post, who had impressed McGlinn mightily as a speaker at the LaConner Fourth of July celebration, the summer before. Campbell gave quite a stem-winder of a speech and kept the small crowd of settlers convulsed with laughter. But McGlinn noted that Campbell's prediction of LaConner's future in 1900 "appeared to be... a picture drawn from a too-fervid imagination." After the party enjoyed a day of peaceful commune with nature across the river from future-Hamilton, they woke in the night to hear piercing blood-curling shrieks. Campbell had slipped off into the night. It was a terrifying moment. The wild and unsettled country, the unearthly shrieks coming at such an hour, and in such a place, completely unnerved them, making the hair on their heads stand and thrilling the blood in their hearts. The men set off in the woods and found him shrieking over and over the name of a local Skagit River Indian, "Ted-auh-an." It was all the men could do to restrain him, but after his struggles ceased, he lapsed into a milder form of what McGlinn described as religious dementia. The party had planned to continue upriver but the women balked and they certainly did not want to continue up or down in Campbell's company. O'Loughlin saved the day when he tricked Campbell into believing that an Indian courier from Swinomish had arrived with a letter from Catholic Father Chirouse that requested Campbell to return downriver immediately. Campbell fell for the bait. He would not be the last man to go insane while living upriver. Robinson's theory certainly pertains in that instance because McGlinn was the most prominent Republican appointee in the region. Besides, he was an ardent prohibitionist who did not allow hotel guests to imbibe alcohol. Meanwhile I am still trying to determine if the 1906 book author was right about Campbell's store in 1868 or if Campbell and Conner took over Barker's location sometime in 1870. The 1906 Illustrated History also notes that South Fork pioneer Joseph Wilson was connected with John Barker. Wilson originally came to Washington Territory in 1868 and briefly lived in Port Townsend after serving as an American sailor on ships trading with China. He came to Fidalgo Island as a logger in 1868 and then preempted land near the mouth of the South Fork and Dry Slough, a ranch that was later called the "Good place" for another family after Wilson moved to the Skiyou (or Skiou) region east of Sedro-Woolley. In his 1906 book biography he is recorded as having "took what there was remaining of Barker's goods up to Whatcom, the then county seat of the present Skagit and Whatcom counties, in a canoe, and delivered them to the authorities." About five years later, Wilson was one of the key subscribers in the early settlers' effort to cut through the two log jams between present Mount Vernon and the fork of the river. Robinson found evidence that the aforementioned John Campbell, the post owner, was also involved with that log jam removal. He also found that Campbell was involved with Alvin Williamson's hop farm that was on the north side of the Skagit River, just west of future Lyman. Other Skagit City notes A few other details we have established about Skagit City include the fact that a post office opened at the Daniel Gage store in Skagit City on April 24, 1872, and was discontinued on March 15, 1904.The seminal fact about Skagit City, however, is its function as a terminus below the log jams for the early sternwheelers that established a trade route between Seattle and southern Puget Sound with the Skagit River. The 1906 book and other sources note that this trade was associated early on with the sternwheeler Fanny Lake, which began the route on 1874. That is at odds with other accounts, however, that establish that the Fanny Lake, a 100-foot boat, was actually launched at Seattle in 1875, the first boat built by the T.W. Lake shipyard. Lake was born in Norway in 1825 and he named the boat for his wife. It was designed with a draft shallow enough to float on a "heavy dew, resisting the groundings of other steamboats on Northwest rivers. It was originally operated by a company called Diggs & True on the Duwamish and White rivers. With its locomotive boiler and two small single-cylinder steam engines, the economical steam winch and hoisting gear, the owners soon determined that it was perfect for the run to the Skagit River. An attached scow could be poled even further for light freight. The captain was named in various sources as either John S. or A.S. Hill and he soon made regular runs between Seattle and Skagit City to deliver freight and mail for all upriver points. On May 21, 1883, the boat sank at Dead Man's riffle, just east of future old Sedro and all of the upper works were destroyed. But six years later, young Joshua Green and his partners in the new La Conner Trading and Transportation Co. resuscitated the Fanny Lake to transport hay and grain from the Skagit River, floating up impossibly shallow sloughs all around Fir Island. The end came in 1893 when the Fanny Lake caught fire on Sullivan Slough near LaConner. We found two other historical notes about early Skagit City. We are still researching whether post-owner Campbell was involved with the contracting firm that blasted out parts of the cliff at LaConner for Paul Polson while he was building a store there in 1890. We also discovered in John Conrad 's1956 obituary notes for the Pioneer Picnic, that George Gage died that year. He was the son of Skagit City merchant Daniel Gage and Conrad recalled that the elder Gage bought out the old Barker Trading Post. Tom Robinson has researched the village very well in preparing for his two volumes that he will soon publish about western Skagit County. While researching, he shared these tidbit from his studies that tell us much more about the little town. The tiny hamlet at the point of the Forks was indeed called "Skagit Forks." The original store right on the forks (junction) had a post office. I have seen a letter stamped by the postmaster with a stamp that says "Skagit Forks" and not "Skagit City." I've seen a letter (in the paper) from 1876 which calls it that. In fact, the letter writer puts on his letter, "Skagit Forks," as its point of origin and proceeds to report the platting of a new town nearby — obviously, what we would call "Skagit City." I had assumed before that the Skagit City name just got moved south when William H. Sartwell platted the town in 1876 and Daniel Gage moved his store business down to the platted area. I have not known what to make of the fact that I've found the name "Skagit City" being used as early as 1874. If the term referred neither to the platted area nor to the store, then to what did it refer? One possibility is the school, which was built on the original John Wilbur claim, In other words, the first actual schoolhouse may well have been exactly where the later one is now. The much more reasonable possibility is that the term "Skagit City" does in fact date from 1874. That was the year, according to the 1906 book [Illustrated History], that regular steamboat service up the Skagit began. Now Mount Vernon did not yet exist, though it became the terminus for sternwheelers (thus dooming Skagit City to slow stagnation) in 1877. Of course, the terminus before then was at Skagit City. I think it very likely that the name was given to the area of the steamboat landing on the assumption that it was bound to become a town. I have come across a reference to "Skagit City" from 1874. William H. Sartwell was appointed to fill a vacancy on the county board of commissioners. He was stated to be from Skagit City, thus a concept of a Skagit City was emerging even before there was any platting. Or maybe the two names were used interchangeably. "Skagit City" apparently has always (until a much later time, at least) referred to the location a mile of so south of the point on Fir Island where the [John] Campbell/ Jim Conner/ Daniel Gage store was located from 1870 to 1876. [James J. Conner was a cousin of John S. Conner, founder of LaConner.] Barker's store of 1869-70 seems not to have been the same one, since it seems to have been on the island across from the point half on the main river and half on the North Fork. But apparently the post office, which clearly existed at Barker's store, was transferred to the Campbell/Conner/later-Gage) store. Skagit Island is down there at the fork. When I look from the Fir Island dike on the north side of the island, the one that looks toward Harmony across the North Fork and at the fork itself, what is out there looks to me like a lot of rocks and brush. I know, however, that Sundquists once farmed there. But if you look on a map you'll find a big chunk just off Harmony that is an island (of sorts). Actually, I would myself want to say that it is a part of Harmony sliced off from it by what amounts (or amounted?) to a slough. That is why we enjoy Tom's research so much. He and I approach history in similar ways, like a dog chewing a bone, as the settlers might have said. On Thursday, Nov. 30, 1876, we left on the steamer Fanny Lake for the Skagit river. The steamer going direct to Seattle on Thursday and from Seattle to Skagit river on Friday; arriving at Skagit City Friday evening, Dec. 1st on the Fanny Lake; we found things in readiness for the Ball, the first ever given in the new hall. With commendable business enterprise, Daniel Gage has caused to be erected the present season a large two-story building. The lower story being of sufficient size for store, warehouse and dwelling. The upper part of the main building being left for a hall to be used for all public purposes, social gatherings, etc. It was expected that there would be a large turnout from the Stillaguamish, as the steamer would stop at Centreville [later renamed Stanwood] going up Friday, and returning Saturday, yet from some unexplained reason not one appeared. The turnout being confined to the river and the Swinomish [slough], where LaConner was located. From the Swinomish we noticed Sheriff [George Washington Lafayette or G.W.L.] Allen and wife; Robt. White and wife James J. Conner and wife; J. Palmer, wife and niece; Mrs. [Caroline] Ball [wife of Jesse Beriah Ball of Sterling], Mrs. [Bessie Jane] Cornelius; Miss Ella Wallace, B.L. Martin [merchant at LaConner]; Edward Seigfried [or Siegfried], John Wallace, J.H. McDonald, John Chilberg and Mr. [David L.] McCormick. Among the familiar faces there, we noticed the following ladies present belonging on the Skagit: Mrs. Eva Gage, Mrs. Katie Gage, Mrs. Sweet, Mrs. Wilbur, Mrs. [James H]. Moores, Mrs. Villeneuve and Mrs. Clark, with Misses Fislar, Villeneuve and Gates, with others not noticed at the time. The hall when completely fitted up will be perhaps the finest north of Seattle. The music was good. Dancing began about 8 o'clock in the evening, was kept up until near morning. The tables were neatly decorated, and spread with a tempting array of food. Four sets danced at a time in the hall. Taken all in all it was a complete success, affording general satisfaction and pleasure. This terrific aerial photo is from the Washington Wildlife and Recreation Coalition website. The photographer was looking north from about the town of Fir and the photo shows the North Fork branching to the left and the South Fork flowing toward the viewer. The bend at Mount Vernon, where the upper log jam once was, is in the background. Skagit City would have been in the foreground, just to the right of the fork in the present clump of trees. Also see this Google Map for the region of South Fork. You can zoom in to see more topographic detail. On Wednesday morning, leaving Mr. [Prichard's] residence, we turned our double-ender skiff up stream, towards Skagit City, visiting the different settlers on the way; stopping at the residences of [Joe] Lisk [who died a few years later and his widow, Caroline, married Jesse Beriah Ball, who founded Sterling]; W.H. Sartwell [the first permanent settler on the South Fork]; C. Thompson; J.V. Abbott; Joseph Wilson [who later became the prime settler of the Skiyou district upriver and the namesake of the early school district there]; A.G. Kelly and L. Sweet. Each and all making our visit pleasant and agreeable, and furnishing much information about the crops, etc., as well as the wonderfully rapid development of the resources of the river in all its business interests; to say nothing of its extraordinary rapid increase in population, caused by the great number of new settlers, coming into the valley for homes on each trip of the Fanny Lake [Sternwheeler]. At Skagit City we found Mr. [Edward] McAlpine was getting his new house fitted up very nicely, and his lady [Jane (Ewing) McAlpine] makes it very pleasant for all who call there. Mr. [Daniel E.] Gage is doing a prosperous business and getting well settled down to domestic life. He carries a large and well selected stock of goods. His dealing is always considered honorable and he has done in the past few years as much or more than one man else resident in the Skagit valley for the growth of that river. Despite the fact that other stores will come, and improved means of communication, with competition in business will gradually necessitate a reduction of prices in some things sold, yet Mr. Gage is a man who always will command a very large, perhaps the leading trade of that river. The large building erected by him, containing store, residence and large public hall would be an acquisition to any community. Adjoining the store of [Daniel] E. Gage, the commodious two-story hotel building of Horan Bros. is fast approaching completion. It is now in condition to receive guests, and opens out with a good patronage. Its location is very convenient, and these gentlemen cannot fail to do well. 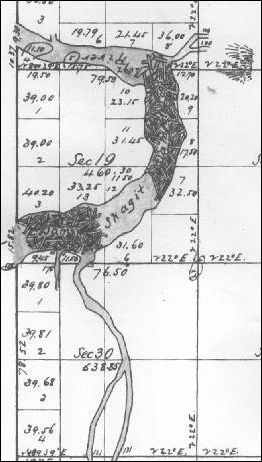 This map, courtesy of Larry Kunzler, shows the location of the log jams in the Skagit River near future Mount Vernon, as drawn by surveyors sometime before 1877. Does anyone know the name of the creek entering the river from the northeast? The stream entering the river from the south on the map would later be named Britt's Slough. 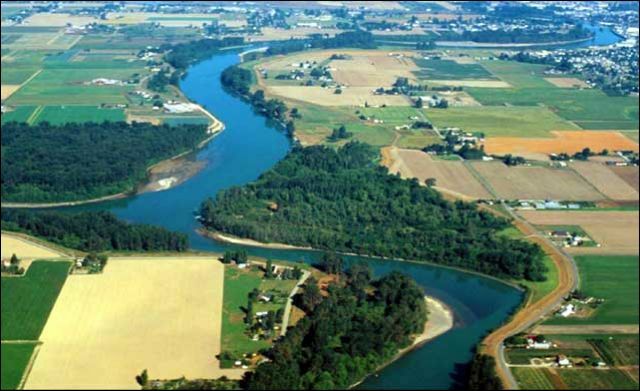 The Skagit flows into the Sound by two mouths, called the North and South forks, forming a delta, on which the new townsite of Skagit City has been laid out. It is located upon bottom land, above the reach of high water. The North Fork is about five miles long and enters the Sound about five miles [south] from LaConner, and the Swinomish flats are considered part of the river valley. The South Fork is the main channel, about eight miles long, and can be easily ascended by light-draught steamers at any season of the year. The peculiar nature of the river is the Jam, about two miles above Skagit City. The lower portion of this obstruction is about a quarter of a mile in length, and the river is clear for three-fourths of a mile to the upper jam, which is half a mile long. It is composed of driftwood, the accumulation of many years, which has become so firmly interwoven that its removal is an engineering problem of no small magnitude. The jam is the great bar to an extension of settlement and the progress of civilization to the head of the river. Only two families have settled above the jam. [Journal Ed. note: at this point, we know of only one such family that was "above" or north of the jam, that being Jasper Gates, who claimed the land that included most of downtown and northern Mount Vernon. His fellow settler, David E. Kimble was located near what is now called Britt's Slough — on the point beside the lower jam. The writer may have meant Joseph F. Dwelley, who pre-empted a claim beside Gates, but by the time this article was written, Dwelley had already removed his family to LaConner. We are still trying to determine where Dwelley's original claim was located and we hope that a reader can eventually help us.] . . .
Washington Standard: Logging can be carried on only to a limited extent until after their removal, as the high land is too far back from the river to haul lumber from. Even the most favorable townsite, Skagit City, was located on the bottomland, near the forks, for the reason of there being no high land on the river below the jam. Perhaps no river in this Territory offers greater inducements than this for settlement, provided this jam was removed. The bottomland, timbered mainly with alder, vine maple, etc., is more easily cleared than the Stillaguamish, Snohomish, or most other river bottomlands in the Territory. The timber on the high land is of excellent quality, as well as easy to get out and float down, there being few obstacles in running logs, after the removal of the jams, to what are found on other rivers, the current of the Skagit being steadier and slower than the Snohomish [River to the south]. Capt. J. S. Hill, of the steamer Fanny Lake, informs the [Seattle] Intelligencer that the jam of logs in the Stillaguamish river was entirely swept out by the late freshet [flood] leaving that river navigable for steamers at eighteen miles above the present head of navigation. On Tuesday morning, Capt. hill was ascending the Skagit river and had nearly reached Gage's store [at Skagit City and the fork of the river] when he descried a vast raft of timber coming down the stream, and knowing there was but little chance to dodge it, he promptly stopped and backed around, after which he made the best of his way out of the river. He has no means of definite information, but believes that a large portion of the great jam has disappeared. Should this be the fact on the Skagit, as well as on the Stillaguamish, it opens up for settlement lands enough to support several thousand families, accessible by a few hours' steaming, to the second largest city on the northern coast. Even if the Stillaguamish alone is opened, five hundred families can find good homes and abundant employment there. It is in the very heart of the Skagit delta, surrounded on every side by one of the richest farming regions in the Northwest. Practically the whole region is in cultivation. The river here is broad and deep, furnishing facilities for extensive steamboat navigation and general boating, all of which is taken advantage of by numerous river boats. A ferry is maintained by the county at this point for the convenience of the public. Like a typical river town, Skagit City was built along the dike, the business houses being built in a row facing the water, beginning with Barker's single trading post in 1869. [Journal ed. note: Tom Robinson and I both suspect that this claim is inaccurate. Barker's store was very possibly located on what was once called Skagit Island, north across the North Fork of the river from the eventual Skagit City, and on the western shore of the main channel of the river. It was an island because a slough flowed along the northern and western sides.] Ten years later Skagit City was a thrifty village with hotels, stores, saloons, school, church and other public buildings. For a few years it continued to grow, but with the rise of Mount Vernon the older town gradually began to decline, losing its business houses to Mount Vernon one by one. At present only one remains, the general store of D.E. Gage, who succeeded more than a quarter of a century ago to the original establishment. Even the postoffice has been discontinued, the rural free delivery routes taking its place. The Skagit Queen, Captain H.H. MacDonald [actually McDonald], calls at the wharf when occasion requires. The town site was platted on the old homestead of W.H. McAlpine, one of the earliest of Skagit's pioneers. Originally the McAlpine dwelling and Barker's store stood further up the river, near the point a few hundred yards above the present buildings. Heavy floods have partly washed away the old site. Skagit City is associated with so much of importance and interest in connection with the early days of Skagit's settlement that it will always live in local history. Its mission as a town, however seems to have been fulfilled. 1. Skagit City School Although the town of Skagit City faded in importance as the upriver towns of Mount Vernon and others grew, there was a large influx of settlers to the northern tip of Fir Island in the 1880s and a school in that area became necessary by 1888. We are studying the excellent research of the late Ronald Holttum and of Solveig Lee, who is very much alive and still researching the history of the Skagit County. Before the Skagit City school was erected, students had walked to the school in the Fir district to the south or to the Wilbur School on the farm of John Wilbur (and later owned by Joseph M. Gunderson), or they crossed the river to the Kelly School, named for the pioneer R.L. Kelly and located on the Peter Egtvet farm, upslope from the eastern shore of the river. That crossing was especially dangerous in the rainy, stormy months and the flood seasons. 2. Daniel E. and William Gage Starting in 1874 (and maybe even before), when the Fanny Lake sternwheeler brought U.S. mail to the Skagit River region, brothers William and Daniel Gage collected and transported mail for everyone living upriver. The mail was delivered to Daniel's Skagit City store and William or someone he hired would paddle a canoe down from the log jams to pick it up. By 1876, Daniel Gage erected the most substantial new building in Skagit City, a two-story structure, with the lower one for a store, warehouse and dwelling. The upper story was a public hall, where the first Skagit Ball was celebrated on Dec. 1, 1876, and lodge quarters for the Masons. When William C. Ewing promoted a public subscription campaign in 1884 to fund the removal of a log jam at the mouth of the Skagit and removal of drifts and snags all the way up to Sterling, Daniel Gage was treasurer of the group. By 1906, Skagit City was a mere shadow of its former self, having given over almost all commerce to Mount Vernon. Gage's store was the last business there, staying open until the Teen years of the early 20th Century. Read about the The Washburn Family and settlement of the South Fork, circa 1871. See Issue 39 of the Subscribers-paid Journal online magazine for the 1998 article, "The Bell Tolls for Skagit School," with several photos. West Skagit County: Hwy 99 to Sound pioneers and features. Transcription of the March and April 1884 issues of the Skagit News newspaper of Mount Vernon about Skagit City and the log jams near Mount Vernon. You can click the donation button to contribute to the works of this website and of Skagit County Historical Society & Museum. Did you find what you were seeking? We have helped many people find individual names or places, so o email if you have any difficulty.